That is exactly what she was like, Clare recalls. Constantly on the move, she had no routines, no sense of boundaries and no fear. Bit by bit, she started to disclose a little of her experiences, particularly when Clare was putting her to bed and reading her a story in their Limerick home. As foster parents, they knew the love and support they could give Aisling would certainly help “but, with the level of trauma she was suffering from, we had to reach for outside help. Coming up against a two-year waiting list for the child and family psychological services in Limerick, Clare contacted the Blue Box creative therapy centre, so named from its origins as a youth project in a blue freight container. Then, with a referral from Aisling’s social worker, she was soon accepted for therapy at the centre, now in the Limerick Enterprise Development Project (LEDP) building in Roxboro. As Aisling had such poor concentration, Clare thought she would probably run out after five minutes, and she also wondered how she would deal with the male therapist. But she stayed for nearly all of that first hour-long session. 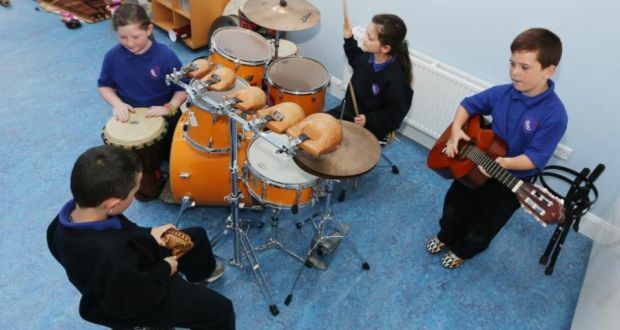 The essence of the work at the Blue Box is using creative arts psychotherapy to remove the emotional block that stops traumatised children from learning, says its chief executive, Bernadette Kenny. The children may have suffered domestic, environmental, emotional or sexual abuse, or maybe bereavement, but a common result will be the biological “fight, flight or freeze” response to the stress. “When a child is traumatised, they can’t learn,” she says simply. The brain stops as it goes into a state of hyper alert. “It’s no good telling them off for not learning, or shouting at them, or giving them extra homework; it just is not going to work.” Creative therapies help to promote emotional stability and self-regulation and to build relationships. What makes the Blue Box the only service of its kind “not only in Ireland but also in Europe”, says Kenny, is that “we are the only creative arts psychotherapy for children that is non-profit, that goes into schools and are the referring agency for social work”. Sitting in one of several small pre-fab offices housed within a former Krups factory, Kenny is looking forward to moving within days into a new centre the Blue Box has built with funding from local benefactor JP McManus’s Invitational Pro-Am golf classic in 2010, topped up by its own fundraising. A mound of packed boxes are ready to be transported to the new premises, just on the other side of this LEDP building. There, a series of vibrantly coloured, spacious therapy rooms – blue for music, red for play and yellow for art – are a world apart from the previous dingy, cramped conditions. Physically it heralds a bright future, but expansion of Blue Box services will depend on an increase in funding. With a mission to help vulnerable children in the city’s marginalised areas such as Moyross, Southill and King’s Island, the therapy team works mostly in schools, but as referrals from social workers grow, they hope to be able to see more children “in- house” too. Having worked in disadvantaged communities in the UK and the US for many years before returning to Limerick, Clare-born Kenny says there’s always suspicion of authority in such areas. On top of that, in Ireland little is known about creative arts therapy. By bringing therapy to schools, they are getting around that barrier and not depending on parents to bring the children to them. Last year Blue Box worked with 140 children in 13 primary schools, 41 in six secondary schools and 15 “inhouse”. It has also started a programme in two preschools, working with child-parent pairings. While more than half of the children attending the Blue Box centre are in State care, about one in four of the children they see in schools is in care too. At the end of June, some 295 children in Limerick were in care and 594 in the HSE Mid-West region as a whole, according to figures released to the Limerick Leader. “There is a lot of neglect in Limerick and it is not talked about,” says Kenny, who reckons many more children would be brought to the attention of social services if schools were to report every child who meets the criteria for “neglect”. These are outlined in the Children First guidelines as “where the child suffers significant harm or impairment of development by being deprived of food, clothing, warmth, hygiene, intellectual stimulation, supervision and safety, attachment to and affection from adults, and/or medical care”. Schools can be reluctant to give details of family background in written assessments of children they are referring to the Blue Box, but will outline them in face-to-face meetings. The Blue Box walks a fine line between wanting to be transparent about its work – and thereby highlighting the needs out there – but at the same time keeping the community’s trust. As children may not have the language to talk about their experiences, creative therapy offers them different art forms, such as music, dance, play and visual art, to express their feelings, within defined, professional boundaries. It is child psychotherapy using arts as a medium because play and movement are the first language of a child,” says Kenny. When a child comes in initially, there’s an array of materials in the therapy room. Funding determines how many children the Blue Box team can see and the numbers have dropped as its income has fallen, although demand for its services is increasing. Last year it operated on a budget of just under €300,000, of which roughly 75 per cent came from State bodies such as the Child and Family Agency (Tusla), the HSE and the Department of Education, and another 25 per cent from fundraising. Kenny is the only full-time employee, while two therapists work four days a week, another seven or eight do sessional work and then are about four qualified counsellors working as interns, as well as a part-time secretary. In addition to schools and social workers referring children to them, “even the courts are referring to us and what isn’t coming with that is the money”, she remarks. Wayne Dignam, a local businessman who spent much of his childhood in care and has recently joined the Blue Box board, is urging Tusla to increase funding for such vital support for foster parents who are looking after traumatised children. “It is impossible for a child to go to school and try to learn, and to fit in with a family, if they are suffering from trauma,” he says. The Blue Box’s services are in great demand “because we have such successful outcomes”, says Kenny. So how do they measure results? After the initial assessment the therapist sets goals. But at stages in the 30-week programme during the academic year, teachers and parents are asked what changes they have noticed in the child, as well as the therapist recording them each week. Pamela, who has fostered children for many years, has seen significant improvements in the teenage girl currently in her care, since she started attending the Blue Box. The teenager feels abandoned by her parents and is full of anger. Not one for doing anything she doesn’t want to do, her foster daughter “loves coming up here”, says Pamela. Before that, she was sick of being brought to “stupid places”. “She can express how she’s feeling in art and music therapy, without sitting down in a chair and being bored off her head.” Youngsters don’t really want to talk while they are face to face, she adds, “but if they are doing something they like, they will chat away”. She has “come down” from her constant hyper state, something her school has noticed too, and she is interacting better with other children. Now Aisling is chatting and laughing, doing all the things that everybody else takes for granted with their kids, Clare remarks.